On Monday, Airbnb filed suit against the city of San Francisco to stop a new law that would require Airbnb to remove any property whose owners had not registered with the city. 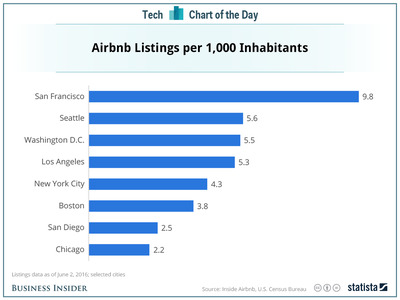 San Francisco is Airbnb’s hometown, but it’s important for another reason, too. As this chart from Statista shows, San Francisco has the highest proportion of Airbnb listings per 1,000 inhabitants of any city in the United States, by a wide margin. If it suddenly had to remove a large proportion of those listings, that would be a blow to its business. It would also set a precedent that other cities might feel compelled to follow.